A special week for all the birding businesses from the Bird Trails Tropical Queensland group in Tropical North Queensland, with a week's visit to the region from a group of international birdwatching journalists. We all had the opportunity to host them and, all in all, they had a fabulous time. We decided that the 'Birding Journo Gods' were watching out for us when they arrived in Daintree. After a few days of miserable rain, the sun came out and so did the birds. 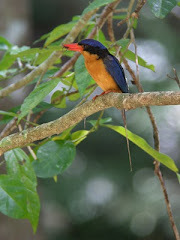 A quick drive to the end of Stewart Creek Rd gave us some of our best birds with Buff-breasted Paradise Kingfisher, Azure Kingfisher, Little Kingfisher, Yellow-breasted Boatbill, Victoria's Riflebird, Pied Monarch, Lovely Fairy-Wren, Cicadabird and many many more birds in feeding flocks, working their way through the forest. Couldn't get the grins off our faces!! 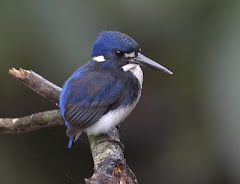 A fabulous couple of weeks for birdwatching in Daintree generally, with good regular views of Great-billed Heron on the Daintree River, a family of four Black-necked Stork on the banks of the river, Red-necked Crake, Pied Monarch and Little Kingfisher at Red Mill House, Cassowary sightings near Cape Trib and Little Eagle in the Daintree Valley.